Just when you have finally said good bye to summer. Just when you have donned your first fall clothes. Just when you have purchased your first pumpkins. You come across these. Sitting proudly in a planter. Snubbing their nose at fall. Saying, aren't I the prettiest shade of geranium you have ever seen? You sigh, pull your summer sandals back out of your closet, pull on a pair of shorts one more time, and vow to have just that shade of salmon colored geranium on your patio next summer. So tomorrow I will face the reality of fall again, but today I am going to raise my face up to the warm sun and pretend it is summer for just one more day. Because PSSSTT!!! tomorrow is October. Such a beautiful color! It is cold here, in the 40s this morning. It's plenty warm here, as we anxiously await the pleasures of October. 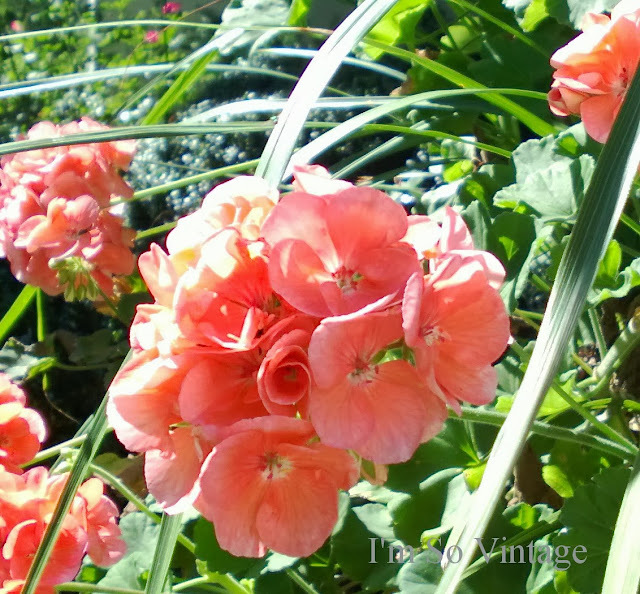 The geraniums are a beautiful color. That is one flower I have never had before, and I think I have only seen them in red and white here. It is Fall here low 30's in the morning and no windows open. We have cooler mornings and cooler nights and the leaves are beginning to change color, but I'm with you! Today is the last day before October. I think October marks the first day of Fall to me.. I'm still wearing shorts and flip flops though. We are going to be in the 80's this week. How lovely! Enjoy this last day of September...we are getting waterlogged here! 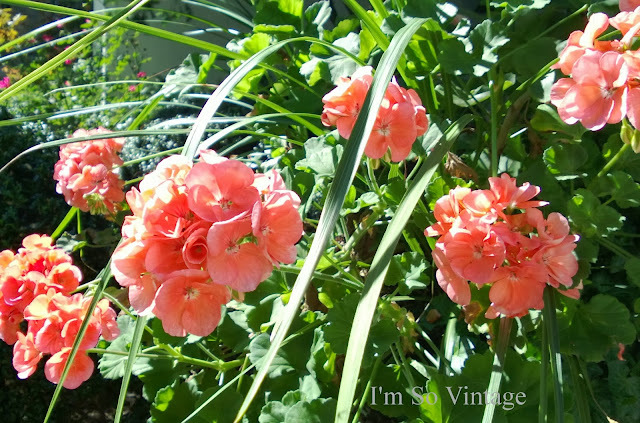 Pretty geraniums. Mine are still looking good. I will have to bring them in soon. But it is more like summer here yet most days. Laura, I feel the same way about fall! Soon all the patio furniture will be put away and the pots will be cleared. I love your geraniums! They are wearing the perfect shade of salmon! I need to savor these days and the flowers for as long as possible. Laura, are you on goggle +. I'm learning to use it and it seems lots of bloggers are using it these days. I don't think Typepad (which I'm on) supports google friend connect. Just wondering because I'd love to get your posts via google + but I see there are plenty of other options. Two of my rose bushes have buds because our September was so warm! Those colors just make me so happy! Those are a lovely fall surprise!